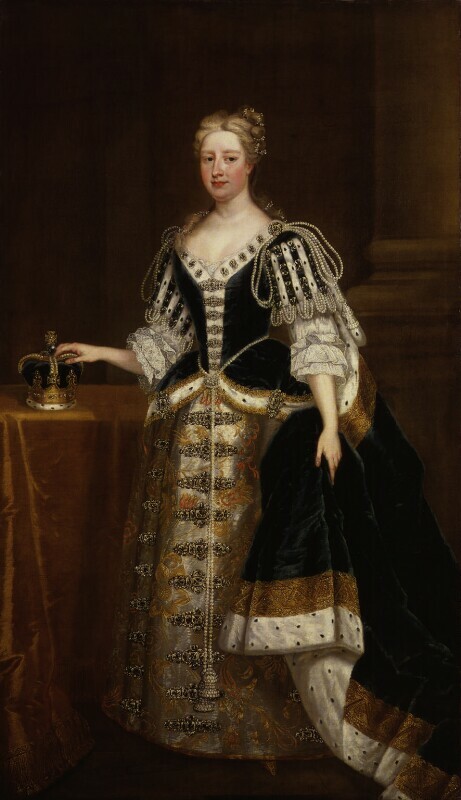 Caroline Wilhelmina of Brandenburg-Ansbach (1683-1737), Queen of George II. Sitter in 36 portraits. Like the companion portrait of her husband, King George II, this is a version of the coronation portrait, which exists in several versions. Her dress, in keeping with John Hervey's waspish reminiscence of the coronation, is described 'as fine as the accumulated riches of the City and suburbs could make it; for besides her own jewels (which were a great number and very valuable) she had on her head and on her shoulders all the pearls she could borrow of the ladies of quality at one end of the town, and on her petticoat all the diamonds she could hire of the Jews and jewellers at the other . . .'. More detailed information on this portrait is available in a National Portrait Gallery collection catalogue, John Kerslake's Early Georgian Portraits (1977, out of print). George I dies on 11 January. George II is proclaimed king; the second Hanoverian on the British throne. Handel composes Zadok the Priest for his coronation which has been sung at every British coronation since. Royal Bank of Scotland is founded by Royal Charter in Edinburgh. Janet (Jenny) Horne of Loth, Sutherland, becomes the last alleged witch to be executed in Britain when she is burned at the stake in Dornoch, Scotland. Artist Thomas Gainsborough is born in Sudbury, Suffolk in May. Architect William Kent publishes Some Designs of Mr Inigo Jones, including additional designs by himself and his patron Lord Burlington.German composer George Frideric Handel becomes a British subject. Scientist Sir Isaac Newton dies. Composer Johann Sebastian Bach conducts the first performance of his St Matthew Passion in St Thomas's church, Leipzig. Spain besieges Gibraltar in order to recapture the territory from the British.